Our daughter loves this swing! We have been putting her in it since she was a newborn. One feature that we love is that the direction of the seat can be turned so that the baby swings forward to back or side to side. This has been wonderful because our baby does not like to swing side to side like many swings do. Also, the adjustable speed and different sounds that it plays are great! The only thing we would change about this product is the legs. The base of the swing is too wide to fit through a standard door without taking the legs off, which is somewhat limiting when it comes to moving the swing from room to room. The legs do have a button that allows them to pop off, but taking the legs off every time you want to move the swing is a little bit tedious. That is the only reason why I gave the swing 4 stars instead of 5. All in all it is a great swing for the price! I’ve been using this swing with my 8 month old son. It is wonderful. He loves it too. 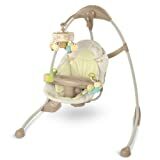 * 6 levels of swing strength, we typically use settings 1-3, but thats just what our baby prefers. * Now that our son is getting bigger, if we put him in this and he’s off center, the swing has a hard time swinging him and will stop eventually…but he’s bigger than most baby’s who will use the swing. (He was born with club feet and has been in casts/braces and had a surgery already, so he’s not crawling or walking yet, I know alot of baby’s will start crawling around this age and may stop using a swing). This swing works great when it does. The songs are not annoying, it’s very quiet. My daughter sleeps for hours on it as long as it’s swing. However, keeping it in motion is a difficult task. My daughter is 2 months old and she’s 13 lbs. Initially I have no problem get the swing going, occasionally she will be off center and it will stop after an hour or so (which I have no problem with, you need to check on the baby every so often anyway). Now she’s 13 lbs it’s almost impossible for me to place her perfectly center to keep the swing going. Regardless of what setting I use the swing barely move and eventually stop after 20 minutes or so and she wakes up. I changed the batteries twice already to see if it will help, it doesn’t. I will have to buy swing, since I am running out of patient with this one.